The guide to the trades of electrical engineering is a didactic software for learning automation and industrial electricity. Published by the company Ingerea, it includes virtual wiring exercises, serial chopper, bridge chopper, inverter, phase angle dimmer, wavelength dimmer, LED lighting, digital oscilloscope, control of a RJ45 link, updated electrical authorization chapter, etc. 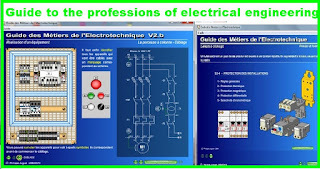 Interactive simulations make it easy to understand the practical cases developed in electrical engineering and industrial electricity.